The MT4 Client Terminal Platform is designed to give you the edge in today's busy trading environment, with live quotes, real-time charts, in-depth news and analytics - as well as a host of order management tools, indicators and expert advisors. Designed for traders looking for an edge in their trading, our MT4 platform offers a rich and user-friendly interface in a highly customizable trading environment to help improve your trading performance. Accessing your portfolio has never been easier. Enhanced charting functionality and sophisticated order management tools help you to control your positions quickly and efficiently. 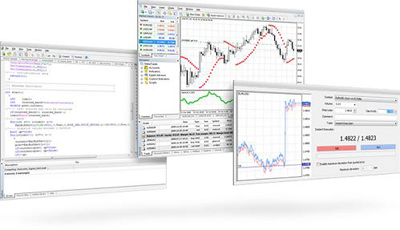 MetaTrader 4 is widely regarded as the world's favorite forex trading platform because it offers an easy to use user interface, various charts and indicators and most importantly the MQL language which allows the user to easily program indicators and also Expert Advisors (EAs) - automated trading strategies that can trade the forex market 24/5 without any user intervention. The Client Terminal is an industry-leading MT4 trading platform with first-class automation, forex charting, and order- execution capabilities. The Client Terminal is designed to enhance trading performance by providing a user-friendly and feature-rich trading environment which can be customized to your personal requirements. The MT4 Client Terminal is the ideal trading platform for advanced traders seeking a competitive edge. Advanced charting technology coupled with sophisticated order-management tools help you to monitor and control your positions quickly and efficiently. The MT4 Client Terminal requires Windows operating system 2000, XP, Vista, or 7. It is also possible to run MT4 natively on Mac OSX; please contact us for more information on this. Bulgarian, Chinese (simplified, PRC), Chinese (Traditional, Taiwan), Czech, Danish, Dutch, English, Finnish, French, German, Hungarian, Italian, Japanese, Korean, Lithuanian, Norwegian, Polish, Portuguese, Romanian, Russian, Slovak, Slovenian, Spanish, Swedish, Ukrainian.